2015 Civil Service Exam for Professional and Sub-professional PPT is now open for application. The first exam for the year is scheduled on May 3, 2015 while the next batch will be on October 18, 2015. File your application as early as possible and be reminded of the deadline. 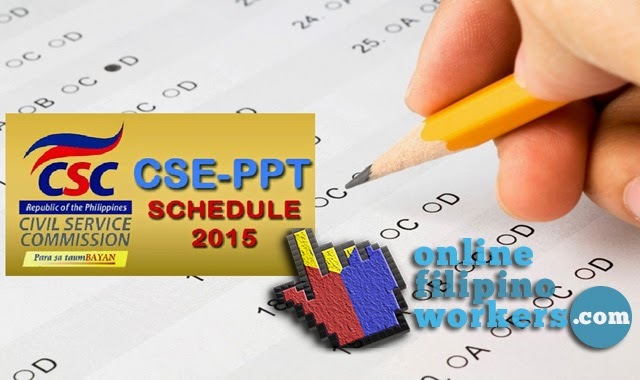 For those who wish to take the CSE PPT on May 3, you must file your application not later than ***March 12, 2015. If you are planning to take the exam on October 18, the filing of application will be on ***May 25, 2015 until September 3, 2015. Though there had been a set deadline, they have also set a quota, or a specific number of applicants per exam to be entertained. The applications may close even before the deadline. File as early as possible to secure a slot. Applicants will be served on a first come first serve basis. To take the test, *you must be a Filipino citizen, 18 years old and above on filing of application, *with good moral character, *have not taken the same level of exam, *had not been convicted of any crime, and *was not dishonorably discharged from military or *dismissed for cause from a civilian position in government. Prepare the needed document for filing. Print and fill in the application form that can also be downloaded online. Bring an original and photo copy of a valid ID, and four copies of ID photos with your signature over your complete first name, middle initial and last name. It is better to tell the photographer that the photo is for CSE to avoid mistake. The application fee is P500. File to the nearest Civil Service Commission Regional Office or field office as you will likely take the test where you have filed. You must personally file for the exam.